- CZW Havoc In Hellware (October 26, '02) = Sabian lost a "Three Way Dance" match to Crazed. Merc was the other participant. - CZW Redefined (September 13, '03) = Sabian lost a "Four Way" Match to Corey Kastle. Kristian Wolfe and Joker were the other participants. - CZW Pain In The Rain II (October 4, '03) = Sabian defeated Joker. - CZW Uprising (October 11, '03) = Sabian & Bianca won over Mercedes Martinez & Joker. - CZW Night of Infamy II (November 14, '03) = Sabian, Jon Dahmer, & Corey Kastle fell to DJ Hyde, Niles Young, & Jude. - CZW Cage of Death V (December 13, '03) = Sabian lost a "Three Way Dance" Match to Jimmy Jacobs. Derek Frazier was the other participant. - CZW Allentown Project (January 16, '04) = Sabian lost a "Five-Way Elimination" Match to Joker. Corey Kastle, Jonny Storm, and Niles Young were the other participants. - CZW Street Fight 2K4 (January 17, '04) = Sabian won a "Tables & Ladders" Match over Chri$ Ca$h, Joker, and Ruckus. - CZW 5th Anniversary Show (February 7, '04) = Blk Out (Sabian & Ruckus) defeated Chri$ Ca$h & Joker. - CZW Bring The Pain II (March 5, '04) = Sabian took down Chri$ Ca$h. - CZW Extreme Overdrive (March 6, '04) = Blk Out (Sabian, Ruckus, & Joker) won a "Six-Man Tables Elimination" Match over Chri$ Ca$h, Sonjay Dutt, & Jimmy Jacobs. - CHIKARA Kids Eat Free On Tuesdays (March 20, '04) = Sabian fell to Joker. - CZW In Da Club (April 2, '04) = Sabian & Petey Williams won over Sonjay Dutt & Jimmy Jacobs. - CZW Retribution (April 3, '04) = Blk Out (Sabian & Ruckus) defeated All Money Is Legal. - CHIKARA Pick Up Or Delivery (April 9, '04) = BLK OUT (Sabian & Joker) took down UltraMantis & Mister ZERO. - CZW Face Off (April 30, '04) = Sabian beat Derek Frazier. - CZW Apocalypse (May 1, '04) = Blk Out (Sabian & Joker) won over CKNY. - CZW Showdown at Brown (May 9, '04) = Sabian pinned Sean Bishop. - CHIKARA Aniversario 3: Dodging The Sophomore Jinx (May 22, '04) = Sabian competed in a "Double Jeopardy Battle Royal", which was won by DJ Skittlez. - CZW Trifecta Challenge II (June 12, '04) = Blk Out (Sabian & Ruckus) defeated Chri$ Ca$h & Derek Frazier. Later on, Blk Out won the CZW Tag-Team Titles, winning over the H8 Club (Nick Gage & Nate Hatred). - CHIKARA Young Lion's Cup II, Night One (July 10, '04) = Sabian beat Niles Young in the first round of the Young Lion's Cup Tournament. - CHIKARA Young Lion's Cup II, Night Two (July 11, '04) = Sabian fell to Jigsaw in the quarter-finals of the Young Lion's Cup Tournament. Larry Sweeney won the tournament. - CZW Possession (August 14, '04) = Blk Out (Sabian, Ruckus, & King) won a "Tables" Match over Chri$ Ca$h & the H8 Club (Nick Gage & Nate Hatred). - CHIKARA Retribution Rumble Of Revenge And Rumble To Remember (August 27, '04) = Sabian was beaten by Mano Metalico. - CZW High Stakes: Always Bet On Black (September 11, '04) = During the Day show, Blk Out (Sabian & Ruckus) retained the CZW Tag-Team Titles, defeating the Spanish Announce Team. Later, during the night show, Blk Out (Sabian & Ruckus) again defended the CZW Tag-Team Straps, fighting to a No-Contest in a "Steel Cage" Match against the H8 Club (Gage & Hatred). - CHIKARA 77 (September 24, '04) = Sabian lost to Crossbones. - CHIKARA Beware Of Barely Badd Blasts And/Or Blood Brawls On The Beach (September 25, '04) = Sabian(CHIKARA) won over Rorschach(Sweet 'n' Sour International) in the "Best of 7" Tournament. CHIKARA won the tournament. - CZW Breaking Point: Let The Chaos Begin (October 9, '04) = BlkOut (Sabian & Ruckus) stayed the CZW Tag-Team Champs, beating Chri$ Ca$h & JC Bailey. - CHIKARA More Songs About Buildings And Food (October 29, '04) = Sabian lost a "European Rules" Match to the wXw Heavyweight Champion, Claudio Castagnoli. - CHIKARA The Cibernetico Cometh (October 30, '04) = BLK OUT (Sabian & Joker) lost to the IWA Mid-South Tag-Team Champions, The Wildcards. - CZW Night of Infamy III (November 14, '04) = Blk Out (Sabian, Ruckus, Maven Bentley, Eddie Kingston, & Robby Merino) won over Chri$ Ca$h, JC Bailey, Nate Webb, & Joker. - CHIKARA Fear Of Music (November 19, '04) = Sabian lost, via forfeit, to Ravage. - CZW Cage of Death VI (December 11, '04) = Team Blk Out (Sabian, Ruckus, Eddie Kingston, & Jack Evans) lost a "Cage of Death" Match to Team Ca$h (Chri$ Ca$h, JC Bailey, Sexxy Eddy, & Nate Webb). Due to the loss, the CZW Tag-Team Titles were awarded to Team Ca$h. - CZW GenZ: The Transfusion (January 8, '05) = Blk Out (Sabian, Ruckus, & Eddie Kingston) defeated Ghost Shadow, Heretic, & Spyral. - CZW Only The Strong: Scarred For Life (February 5, '05) = Blk Out (Sabian & Eddie Kingston) won over Excalibur & Super Dragon. - CHIKARA Tag World Grand Prix '05, Night One (February 18) = Sabian & Jigsaw took down Ravage & Rorschach and The Ring Crew Express in the first two rounds of the Tag World Grand Prix Tournament. - CHIKARA Tag World Grand Prix '05, Night Three (February 20) = Sabian & Jigsaw won, via DQ, over Necro Butcher & Mad Man Pondo, then fell to eventual winners Arik Cannon & Claudio Castagnoli in the Tag World Grand Prix Tournament. - CZW Liberated (March 12, '05) = BlkOut (Sabian & Eddie Kingston) fell to Jon Dahmer & DJ Hyde. - CHIKARA Remain In Light (March 18, '05) = Sabian, Mike Quackenbush, & Jigsaw lost to The Kings of Wrestling (Arik Cannon, Claudio Castagnoli, & Chris Hero). - CHIKARA Don't Eat The Black Ones (March 19, '05) = Sabian lost to the CHIKARA Young Lion's Cup Champion, Jigsaw. - CZW Trifecta Challenge III (April 2, '05) = Sabian won the CZW Junior Heavyweight Title, beating Mike Quackenbush. - CHIKARA Speaking In Tongues (April 15, '05) = Sabian retained the CZW Junior Heavyweight Title, defeating Ravage. - CZW Best of the Best V (May 14, '05) = Sabian lost in the first round to B-Boy. Mike Quackenbush won the tournament. - CHIKARA Aniversario Blue (May 20, '05) = Sabian fell to Arik Cannon. - CZW Violent By Design (June 11, '05) = Sabian lost a "Three Way" Match to Mike Quackenbush, who won the CZW Junior Heavyweight Title. B-Boy was the other participant. - CHIKARA Stop Making Sense (June 17, '05) = Sabian was beaten by Chris Hero. - CZW High Stakes III (July 9, '05) = Blk Out (Sabian, Ruckus, & Eddie Kingston) defeated Sexxy Eddy, Nate Webb, & B-Boy. - CHIKARA Young Lions Cup III, Night One (July 22, '05) = Sabian defeated Dr Cheung, then lost a "Six Way Elimination" Match to Icarus in the CHIKARA Young Lion's Cup Tournament. Arik Cannon, Mickie Knuckles, Ricky Reyes, and Rorschach were the other participants. Shane Storm won the tournament. - CHIKARA Young Lions Cup III, Night Two (July 23, '05) = In a non-tournament match, Sabian, Mike Quackenbush, & Jigsaw fell to The Dark Breed (UltraMantis Black, Blind Rage, & Hallowicked). - CHIKARA Young Lions Cup III, Night Three (July 24, '05) = In a non-tournament match, Sabian, Eddie Kingston, Mike Quackenbush, & Equinox beat Gran Akuma & The Kings of Wrestling (Arik Cannon, Claudio Castagnoli, & Chris Hero). - CZW Deja Vu III: Wired (August 13, '05) = Blk Out (Sabian & Eddie Kingston) took down Jon Dahmer & DJ Hyde. - CZW Point of No Return (October 8, '05) = Sabian lost a "Six Way" Match to the CZW Junior Heavyweight Champion, Derek Frazier. JC Bailey, Mike Quackenbush, Niles Young, and Heretic were the other participants. - CHIKARA Little Creatures (October 21, '05) = Sabian defeated Jay Phoenix. - CHIKARA The Cibernetico Returneth (October 22, '05) = Sabian competed in the "Torneo Cibernetico" Match, which was won by Gran Akuma. - CZW Night of Infamy IV (November 12, '05) = Sabian pinned Heretic. - CHIKARA Running In The Red (November 13, '05) = BLK OUT (Sabian & Eddie Kingston) defeated Up In Smoke. - CHIKARA True Stories (November 18, '05) = Sabian lost to the ICW/ICWA Texarkana Television Champion, Larry Sweeney. - CHIKARA Hors D'Ouerves And Dynamite (November 19, '05) = Sabian beat Arik Cannon. - CZW Cage of Death VII (December 10, '05) = Blk Out (Sabian & Eddie Kingston) lost to the CZW Tag-Team Champs, Claudio Castagnoli & Chris Hero. - CZW Afternoon of Main Events (January 14, '06) = Blk Out (Sabian, Ruckus, & Eddie Kingston) won over Super Dragon, Claudio Castagnoli, & Chris Hero. - CZW Seven Years Strong: Settle The Score (February 11, '06) = Sabian won the "Showcase Gauntlet #1 Contenders" Match. Later on, Sabian fought to a No-Contest with the CZW Junior Heavyweight Champ, Derek Frazier. - CHIKARA Tag World Grand Prix '06, Night One (February 24) = BLK OUT (Sabian & Eddie Kingston) defeated Team IWA-MS (Mickie Knuckles & Ian Rotten) and Necro Butcher & Joker in the first two rounds of the Tag World Grand Prix Tournament. - CHIKARA Tag World Grand Prix '06, Night Three (February 26) = BLK OUT (Sabian & Eddie Kingston) fell to F.I.S.T. in the Tag World Grand Prix Tournament. The Kings of Wrestling (Castagnoli & Hero) won the tournament. - CZW When 2 Worlds Collide (March 11, '06) = Sabian lost a "Six Way" Match to Niles Young, who won the CZW Junior Heavyweight Title. Derek Frazier, Cheech, Cloudy, and Heretic were the other participants. - CZW Any Questions? 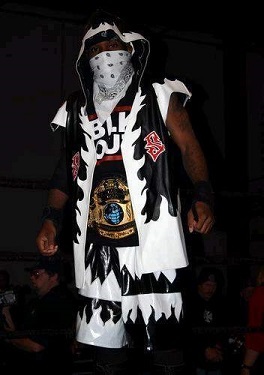 (April 15, '06) = Blk Out (Sabian, Ruckus, Eddie Kingston, & Joker) beat Christopher Bishop, Lionel Knight, & the H8 Club (Nick Gage & Justice Pain). - CHIKARA Sand In The Vaseline (April 21, '06) = BLK OUT (Sabian & Eddie Kingston) beat 2.0. - CZW Best of the Best VI (May 13, '06) = Sabian and Matt Sydal survived the "Triple Threat" Match over Sonjay Dutt. Sabian then beat Sydal, before losing in the final "Four Way" Match to Ruckus. Austin Aries and Claudio Castagnoli were the other participants. - CZW Strictly CZW (June 10, '06) = Blk Out (Sabian, Ruckus, Eddie Kingston, & Joker) fought to a No-Contest with the Forefathers of CZW (John Zandig, Lobo, & the H8 Club (Gage & Pain)). - CZW A Prelude To Violence (July 8, '06) = Blk Out (Sabian & Joker) won a "Three Way" Match over the H8 Club (Gage & Pain) and Kevin Steen & El Generico. - CZW Trapped (August 12, '06) = Blk Out (Sabian, Ruckus, Robbie Mireno, & Joker) lost an "All Out War Cage" Match to Eddie Kingston & the H8 Club (Gage & Pain). The Canadians (Kevin Steen, Frankie the Mobster, El Generico, & LuFisto) were the other participants. - CZW Fear (October 15, '06) = Blk Out (Sabian & Ruckus) beat Drew Gulak & the Human Tornado. - CZW Night of Infamy V (November 11, '06) = Blk Out (Sabian & Robbie Mireno) won the CZW Tag-Team Titles, defeating the Kings of Wrestling. - CHIKARA From Zero To Hero (And Castagnoli) (November 12, '06) = BLK OUT (Sabian & Joker) lost in the opening round of the CHIKARA Campeonatos de Parejas Titles #1 Contenders Tournament to Irish Airborne. F.I.S.T. won the tournament. - CZW Cage of Death 8 (December 9, '06) = Blk Out (Sabian & Robbie Mireno) lost the CZW Tag Titles to the Original Blackout (Onyx & Rainman). - CZW New Year, New Opportunities (January 13, '07) = Blk Out (Sabian & Ruckus) won the CZW World Tag-Team Titles, beating Onyx & Rainman. - CZW H8 (February 10, '07) = Blk Out (Sabian & Ruckus) retained the CZW World Tag-Team Titles, winning a "Triple Threat" Match over the New Jersey All-Stars and Team AnDrew. - CHIKARA King of Trios Tournament '07, Night Two (February 17) = BLK OUT (Sabian, Joker, & Ruckus) lost in the first round of the tournament to Team TNA (Sonjay Dutt & The Motor City Machine Guns). - CZW Redemption (March 10, '07) = Blk Out (Sabian & Ruckus) stayed the CZW World Tag-Team Champs, beating Checkmate. - CHIKARA Best Imitation Of Myself (March 23, '07) = BLK OUT (Sabian & Joker) were beaten by 2.0. - CHIKARA Time Will Prove Everything! (March 24, '07) = BLK OUT (Sabian, Eddie Kingston, Joker, & Ruckus) fell to Hallowicked & The Colony (Fire Ant, Soldier Ant, & Worker Ant). - CZW Out With The Old, In With The New (April 7, '07) = Blk Out (Sabian & Ruckus) defended the CZW World Tag-Team Straps, taking down Derek Frazier & Niles Young. - CHIKARA Rey De Voladores (April 22, '07) = BLK OUT (Sabian & Joker) lost to The Colony (Soldier Ant & Worker Ant). - CZW Restore The Order (May 12, '07) = Sabian defeated Derek Frazier. - IWA Mid-South Chris Candido Cup Tag-Team Tournament '07 (May 25 - 26) = Sabian & Joker lost in the first round to Davey Richards & BJ Whitmer. Sal & Vito Thomaselli won the tournament. - CZW Tournament of Death 6 (June 9, '07) = In a non-tournament match, Blk Out (Sabian & Ruckus), as the CZW Tag Champs, lost a "Non-Title" Match to Team AnDrew. - CHIKARA Young Lions Cup V, Night Three (June 24, '07) = In a non-tournament match, BLK OUT (Sabian & Ruckus) defeated The Colony (Fire Ant & Soldier Ant). - CZW Chri$ Ca$h Memorial '07 (September 8) = Blk Out (Sabian & Ruckus) fought to a No-Contest against Derek Frazier & Niles Young. Later on, Blk Out (Sabian & Ruckus) lost the CZW World Tag-Team Titles, losing a "Three Way" Match to Team AnDrew. Derek Frazier & Niles Young were the other participants. - CZW TOD Fast Forward (September 15, '07) = In a non-tournament match, Sabian lost a "Three Way" Match to Niles Young. Drew Gulak was the other participant. - CHIKARA Cibernetico & Robin (September 22, '07) = BLK OUT (Sabian, Eddie Kingston, & Joker) fell to The Colony (Fire Ant, Soldier Ant, & Worker Ant). - CZW Choosing Sides (October 13, '07) = Sabian defeated Cloudy. Later on, Sabian won the CZW World Junior Heavyweight Title, beating Danny Havoc. - CZW Night of Infamy VI (November 10, '07) = Sabian retained the CZW World Junior Heavyweight Title, taking down LuFisto. - CHIKARA Battle Of Who Could Care Less (November 16, '07) = BLK OUT (Sabian, Eddie Kingston, & Joker) were beaten by Tim Donst & Incoherence. - CZW Cage of Death IX (December 8, '07) = Sabian stayed the CZW World Junior Heavyweight Champion, winning again over LuFisto. - CZW New Years Resolutions (January 12, '08) = Sabian kept the CZW World Junior Heavyweight Strap, defeating Azrieal. - CHIKARA Two Eyebrows Are Better Than One (January 27, '08) = Sabian defeated Jimmy Olsen. - CZW 9 F'n Years (February 9, '08) = Sabian defended the CZW World Junior Heavyweight Title, beating Brandon Thomaselli. - CZW Winner Takes All (April 5, '08) = BLK OUT (Sabian & Ruckus) fell to Alex Colon & Joe Gacey. - CHIKARA Passion And Persistence (April 20, '08) = Sabian took down Pantera. - CZW Best of the Best 8 (May 10, '08) = Sabian won a "Three Way" Match over Drake Younger and the Best Around, then beat Drew Gulak and Chuck Taylor to win the Best of the Best Tournament. Later on, Sabian lost the CZW Junior Heavyweight Title to Chuck Taylor. - CZW Tournament of Death VII (May 17, '08) = In a non-tournament match, BLK OUT (Sabian & Ruckus) defeated Alex Colon & Joe Gacey. - CZW Deja Vu 4 (August 9, '08) = Sabian lost a "Junior Heavyweight Title #1 Contenders" Match to Pinkie Sanchez. - CZW Chri$ Ca$h Memorial '08 (September 13) = Team BLK OUT (Sabian, Eddie Kingston, Joker, & Ruckus) lost to Team Ca$h (Derek Frazier, Nick Gage, Nate Webb, & B-Boy). - CZW Down With The Sickness 4Ever (September 13, '08) = BLK OUT (Sabian & Joker) defeated Derek Frazier & B-Boy. - CZW Decision '08 (October 11) = BLKOUT (Sabian & Ruckus) won the CZW World Tag-Team Titles, beating 2 Girls, 1 Cup. Later on, BLKOUT retained the titles, defeating the H8 Club. - CZW Open Book: Fan Appreciation Show '09 (January 10) = Sabian defeated Adam Cole. - CZW Decade of Destruction: 10th Anniversary Show (February 14, '09) = Sabian took down Egotistico Fantastico. - CZW Total Havoc (March 14, '09) = Sabian was beaten by LJ Cruz. - CZW Blood Pressure: Rising (May 9, '09) = Sabian won over Rich Swann. - CZW Best of the Best 9 (June 13, '09) = Sabian lost in the opening round of the "Best of the Best 9" Tournament. Egotistico Fantastico won the tournament. - CZW 11th Anniversary Show (Night) (February 13, '10) = Sabian won the CZW World Junior Heavyweight Title, winning a "Six-Man" Match over Drew Blood, Adam Cole, Greg Excellent, Egotistico Fantastico, and Devon Moore. - CZW Walking On Pins & Needles (March 13, '10) = Sabian, as the CZW World Junior Heavyweight Champion, fought to a 15-Minute Draw with Adam Cole. - CZW Dragon Night (March 27, '10) = Sabian retained the CZW World Junior Heavyweight Title, beating Ruckus. - CZW Swinging For The Fences (April 10, '10) = Sabian stayed the CZW World Junior Heavyweight Champion, fighting to a 20-Minute Draw with Adam Cole. - CZW Fist Fight (May 8, '10) = Sabian lost the CZW World Junior Heavyweight Title, losing a "Three-Way" Match to Adam Cole. Ruckus was the other participant. - CZW Lines In The Sand (June 12, '10) = Sabian took down Ruckus. - CZW Home Sweet Home (July 10, '10) = Sabian won a "1-In-8 Chance Fourway" Match over Sami Callihan, Greg Excellent, and A.R. Fox. - CZW Southern Violence (August 7, '10) = Sabian lost, via DQ, to Tyler Veritas. - CZW A Tangled Web III (August 14, '10) = Philly's Most Wanted (Sabian & Joker) won a "CZW World Tag-Team Titles Tournament" Match over Adam Cole & Tyler Veritas. - CZW Down With The Sickness '10 (September 10) = Sabian lost to the CZW World Junior Heavyweight Champion, Adam Cole. - CZW It's Always Bloody In Philadelphia (October 9, '10) = Sabian lost a "Four Way" Match to Rich Swann. Ryan Slater and Amasis were the other participants. - CZW Deja Vu 5 (October 16, '10) = Sabian defeated Tomasso Ciampa. - CZW Night of Infamy 9: Betrayal (November 13, '10) = Philly's Most Wanted won a "CZW World Tag-Team Titles Tournament Semi-Finals" Match over Irish Driveby. - CZW Cage of Death XII (December 11, '10) = Philly's Most Wanted won the CZW World Tag-Team Titles, defeating The Osirian Portal. - CZW From Small Beginnings... Comes Great Things (January 7, '11) = Philly's Most Wanted retained the CZW World Tag-Team Titles, fighting to a No-Contest with The Briscoes. - CZW Twelve: Anniversary (February 12, '11) = Philly's Most Wanted lost the CZW World Tag-Team Titles, losing a "No Disqualification" Match to The Briscoes. - CZW Status Update: Fantastic (March 12, '11) = BLK Jeez took down Jay Briscoe. - CZW Best of the Best X (April 9, '11) = In a non-tournament match, Philly's Most Wanted & Robert Anthony fell to Devon Moore & The Briscoes. Due to the win, Moore won Anthony's CZW World Heavyweight Title. - CZW International Incident (April 10, '11) = Philly's Most Wanted defeated Azrieal & Bandido Jr.
- CZW Proving Grounds (May 14, '11) = Philly's Most Wanted won the CZW World Tag-Team Titles, taking down The Briscoes. - CZW Prelude To Violence 2 (June 11, '11) = Philly's Most Wanted retained the CZW World Tag-Team Titles, beating Azrieal & Bandido Jr.
- CZW Tournament of Death X (June 25, '11) = In a non-tournament match, Philly's Most Wanted beat Devon Moore & Little Mondo. - CZW A Tangled Web 4 (August 13, '11) = BLK Jeez lost a "Lumberjack Strap" Match to the CZW World Heavyweight Champion, Devon Moore. - CZW Down With The Sickness '11 (September 10) = Philly's Most Wanted stayed the CZW World Tag-Team Champions, beating Team Fight Club Pro. - CZW Cerebral (October 7, '11) = Philly's Most Wanted defeated Derek Frazier & Ryan McBride. - CZW Night of Infamy 10: Ultimatum (November 12, '11) = Philly's Most Wanted lost the CZW World Tag-Team Titles to Azrieal & Bandido Jr.
- CZW Indie Summit '11 (December 3, '11) = Philly's Most Wanted won over Devon Moore & Kamui. - CZW Cage of Death XIII (December 3, '11) = Philly's Most Wanted fought to a No-Contest with Eddie Kingston & Homicide. - CZW 13th Anniversary Show (February 11, '12) = BLK Jeez won a "Voorhees Street Fight" over Homicide. - CZW Aerial Assault '12 (March 10) = Philly's Most Wanted & Dave Crist fell to Jake Crist, AR Fox, & Chuck Taylor. - CZW Proving Grounds (May 12, '12) = BLK Jeez lost to the CZW World Junior Heavyweight Champion, Drake Younger. - TNA X Division Title Tournament (June/July '12) = Rashad Cameron beat Mason Andrews in the first round of the tournament. - TNA Destination X '12 (July 8) = Cameron lost in the semi-finals to Sonjay Dutt. Zema Ion won the tournament.